While the Woodstock Music and Art Fair is the most famous of music festivals, few realize that it was just one of dozens in 1969 and that many of the same Woodstock artists performed at those others. Here are the ones I’ve found. 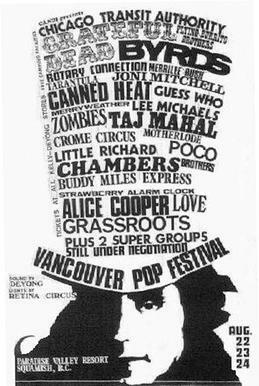 I’ve done a separate blog entries for most of these and if so the festival title is a link you can find out more with. 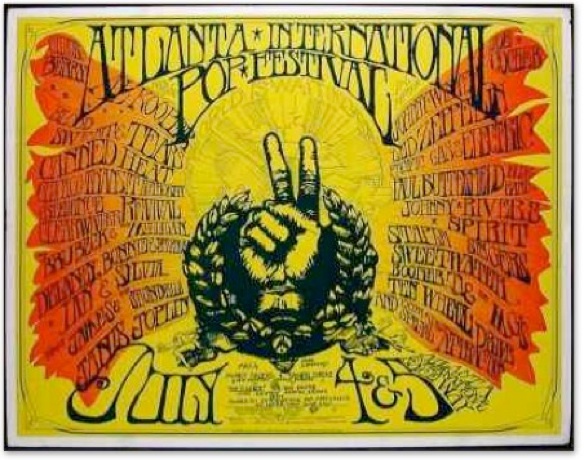 The line-up was likely Spirit, Nitty Gritty Dirt Band, and Taj Mahal, interspersed with anti-war speeches. Performers (likely): The Ace of Cups, All Men Joy, Birth, Beggars Opera, Big Brother and the Holding Company, Boz Scaggs, Chocolate Watchband, Crabs, Crow, Cleanliness and Godliness Skiffle Band, Devine Madness, Denver, The Doobie Brothers, Elgin Marble, Flamin’ Groovies, Frumious Bandersnatch, Gentle Dance, Greater Carmichael Traveling Street Band, Glass, Mountain, High Country, Jefferson Airplane, Joy of Cooking, Last Mile, Libras, Lamb, Living Color, Linn County, Mother Ball, Morning Glory, Mad River, Mt. 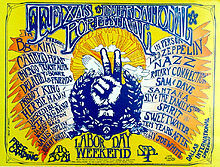 Rushmore, Nymbus, Old Davis, Quicksilver Messenger Service, Red Grass, Green Smoke, Rubber Maze,Rising Tide, Rejoice, Sunrise, Sable, Sons of Champlin, Sounds Unlimited Blues Band, Sandy Bull, The Steve Miller Blues Band, Strawberry Alarm Clock, Stoned Fox, South Bay Experimental Flash, Throckmorton, Tree of Life, Weird Herald, Womb, Warren Purcell, and Zephyr Grove. 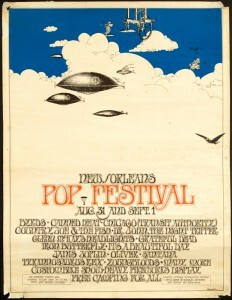 The poster for was created by rock artist Linda Segul. Performers: Grateful Dead, Joe South, NRBQ, The Nervous System, Jane and the Electric Jive Wire, Rhinoceros, Muddy Waters, Sun Country, Sweetwater, Johnny Winter, Youngbloods, The Echo, and Aum. 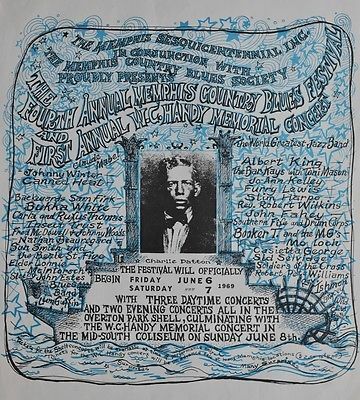 The Festival will officially begin Friday June 6 and Saturday June 7, 1969 with three daytime concerts and two evening concerts all in the Overton Park Shell, culminating with the W.C. 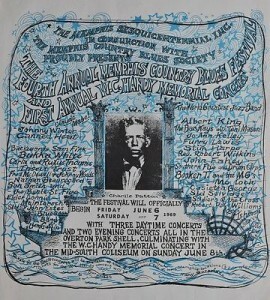 Handy Memorial Concert in the Mid-South Coliseum on Sunday June 8th. 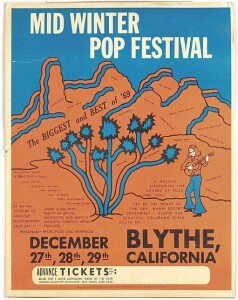 This was the 2nd year for the festival, with the first, the Newport Pop Festival, had been held in Costa Mesa, CA. 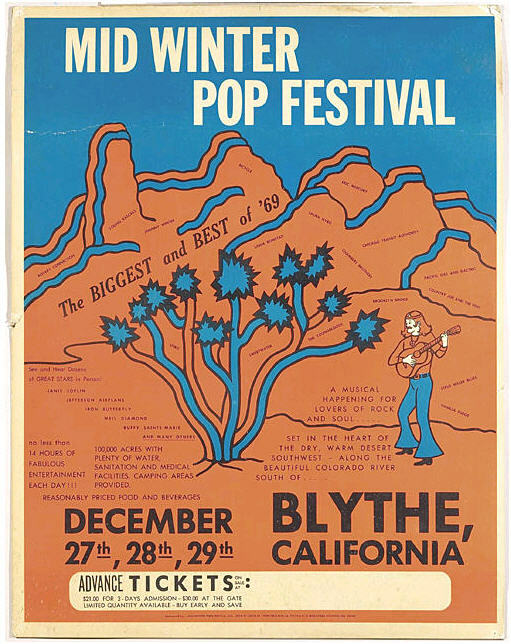 Attended by an estimated 200,000 fans, the festival was the largest pop concert up to that time and is considered the more famous of the two Newport Pop Festivals, possibly because of the appearance of the Jimi Hendrix Experience, who got top billing. 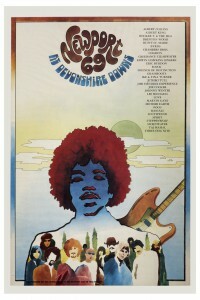 Hendrix was the headline act for the Friday night opening, but he played so poorly – supposedly from an LSD-laced drink – that he returned to the stage on Sunday. 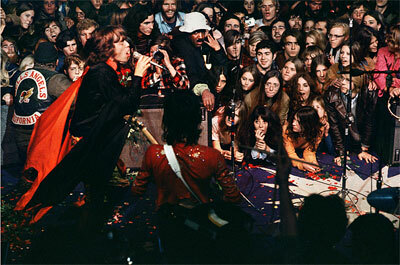 His Sunday performance with Buddy Miles, Eric Burdon, and several others lasted more than two hours. Despite a poor sound system, a lack of food, water, and restrooms, and brutal security by the Hells’ Angels, it was deemed a resounding success by the attendees and musicians. 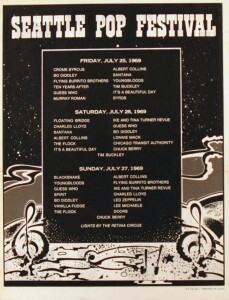 From Wikipedia: Throughout much of the festival, a crowd gathered outside the venue and demonstrated against having to pay to hear the acts. They also tried to breach the gates and security fences. The Denver Police were forced to employ riot tactics to protect the gates. On the second day the battle between gatecrashers outside the stadium and the police suddenly affected those inside. With a combination of shifting wind and re-thrown canisters, tear gas suddenly swept over the crowd. The seats emptied into the concourses and onto the field. It was fortunate that the fence that had been erected to keep the crowd from the field was torn down by the crowd on Friday night. 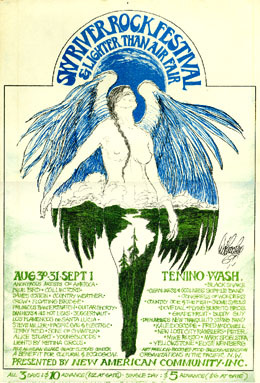 On Friday night Iron Butterfly “encouraged” the crowd to bring down the fence – which they did. If the fence had been up on Saturday there may have been injuries with the crush of people that would have likely occurred with people trying to get out of the stands onto the field to get away from the tear gas. Announcer Chip Monck should be credited with calming the crowd that day as the tear gas came into the stadium. With his amazing voice he instructed the crowd to stay calm – to cover their faces with whatever they had (like a jacket or t-shirt) – etc. Chip Monck was also the announcer at Woodstock – you can hear him in the movie Woodstock. 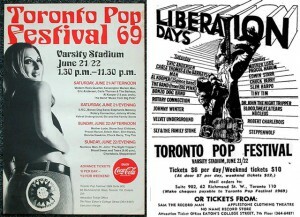 Ticket prices were $6 per day, or $15 for all three days (Fri, Sat, Sun). On Sunday, after all possible tickets had been sold, the promoter announced from the stage that he was declaring it a “free festival”. The people from outside the stadium were let in and took seats in the South Stands of the old Mile High Stadium. DJ John Peel. 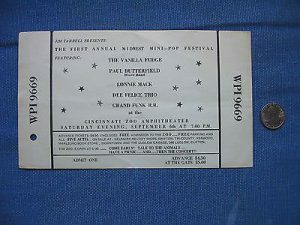 Tickets cost 18/6. 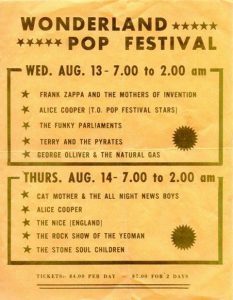 The festival proved very popular, selling out all 30,000 tickets in the first week, surprising both the townsfolk and the promoters. The only major problem occurred when the Nice’s use of bagpipers caused the stage to collapse. 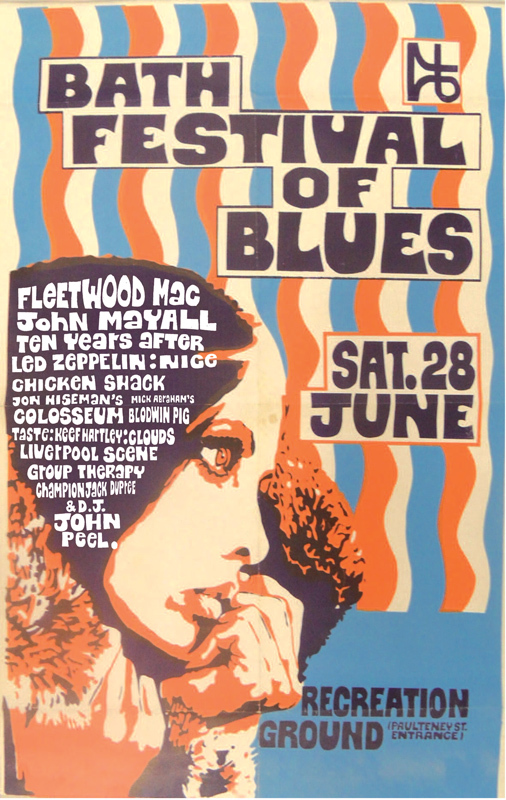 This is often considered the first modern ‘rock’ festival in Britain. 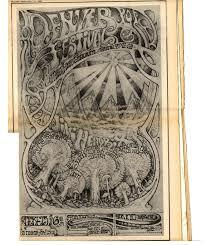 The festival’s 1969 program was an experiment in fusing jazz, soul and rock music and audiences. 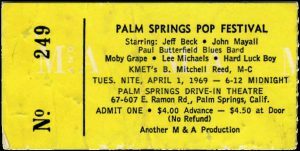 Its lineup included, besides jazz, Friday evening appearances by rock groups Jeff Beck, Blood, Sweat & Tears, Ten Years After, and Jethro Tull. 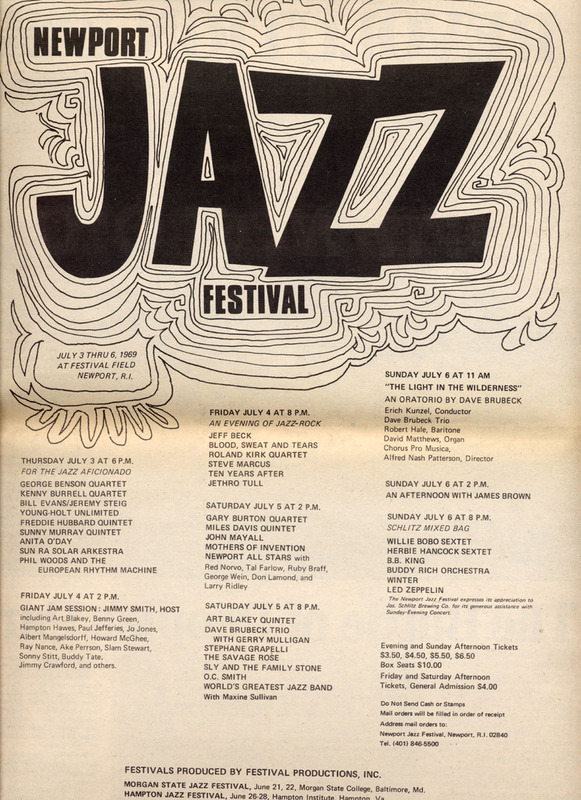 Saturday’s schedule mixed jazz acts such as Miles Davis and Dave Brubeck with others including John Mayall and Sly & the Family Stone. 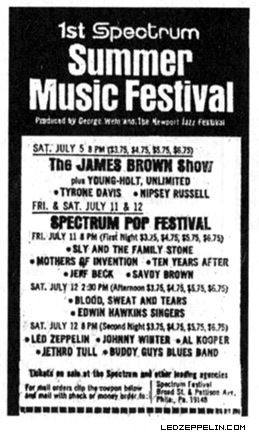 James Brown was among those who appeared Sunday afternoon, followed in the evening by Johnny Winter, Herbie Hancock, B. B. King, and Led Zeppelin. 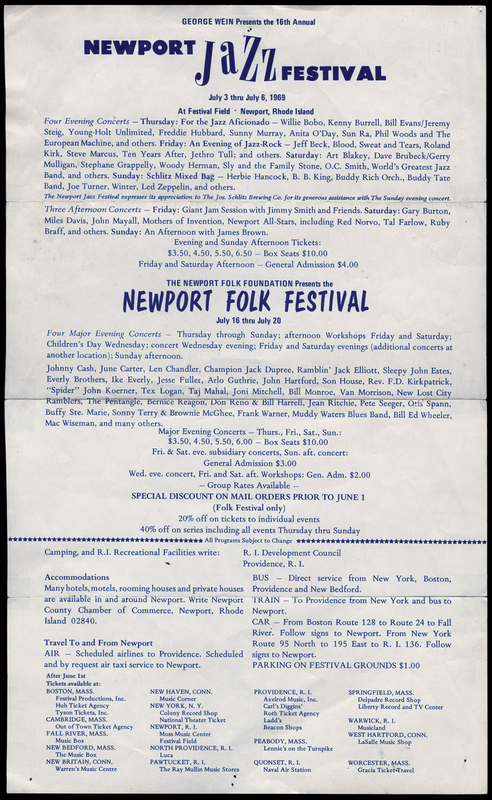 According to the NYT, on July 6 “The Newport Jazz Festival was invaded…by several hundred young people who broke down a section of the 10-foot wooden fence surrounding Festival Field and engaged in a rock throwing battle with security guards.” NYT Newport Jazz report. 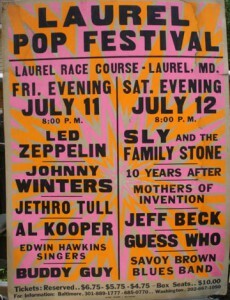 From the Baltimore Sun: Lost in the smoky haze of 1960s history is The Laurel Pop Festival held in July 1969, which was attended by 15,000 fans and offered an incredible lineup of some of the biggest pop performers of the year. 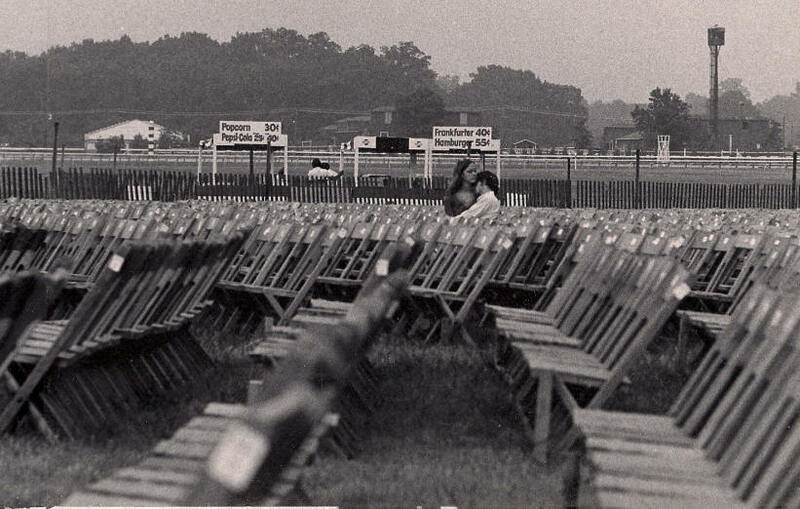 Held just one month before Woodstock, The Laurel Pop Festival ended in controversy as rain-soaked fans built bonfires with wooden folding chairs and refused to leave as the concert dragged on into the early morning. 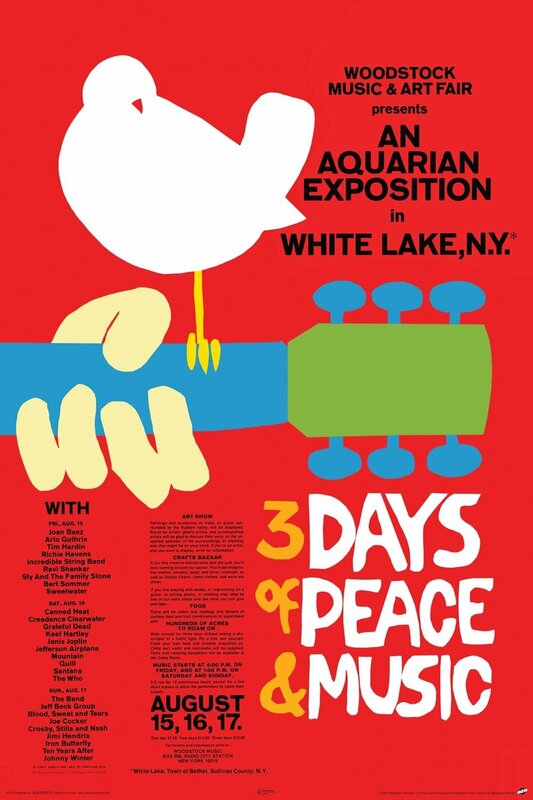 ..news from the Woodstock Music and Art Fair. The Doors were billed as the headliner for the third day. After The Doors played, Led Zeppelin came on. 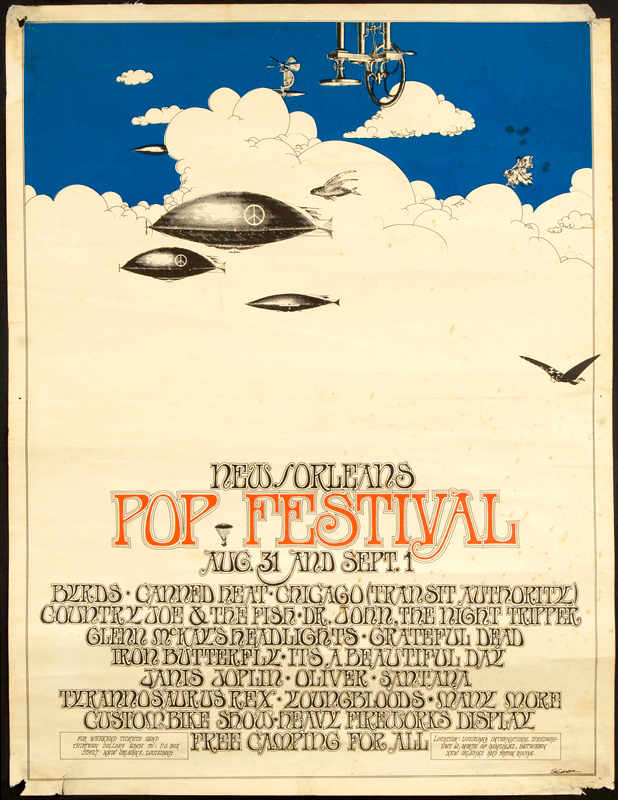 When the festival was first being put together,Led Zeppelin was still gaining momentum. 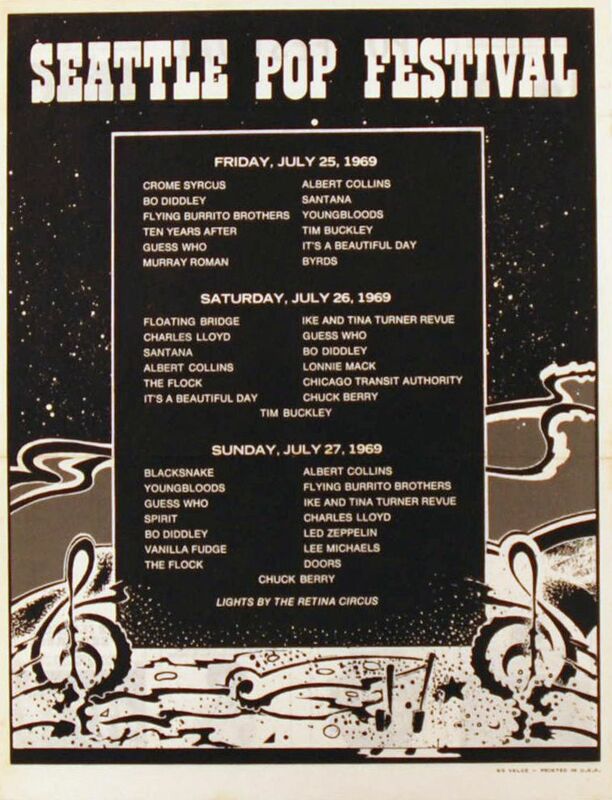 According to the sources, Led Zeppelin stole the show. 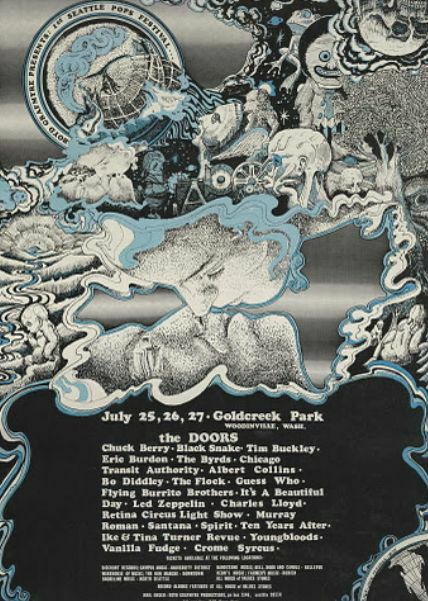 It was the only time The Doors and Led Zeppelin were on the same bill. Total attendance of about 45,000. 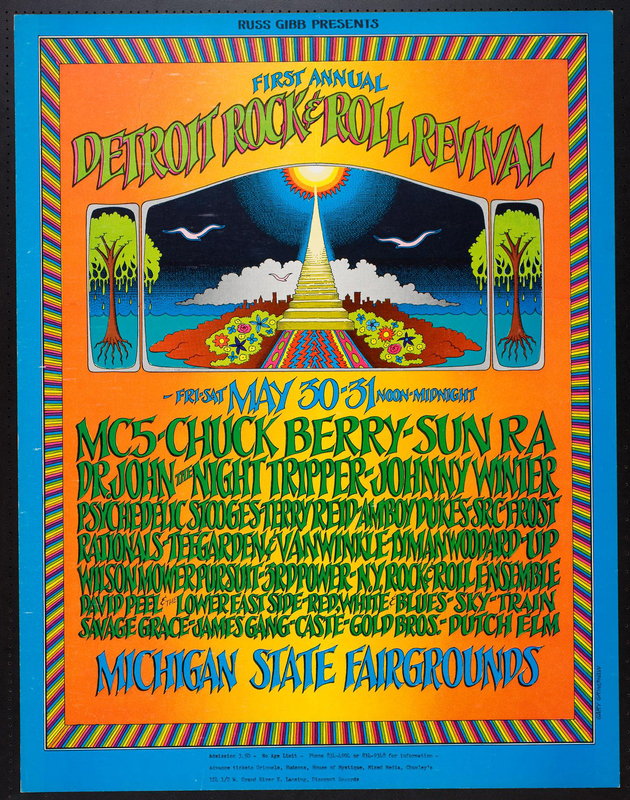 The scheduled list of bands was even longer than the number that actually played – Jethro Tull, Jeff Beck and the Bob Seger System were scheduled on Sunday, but rain canceled many of that day’s performances. 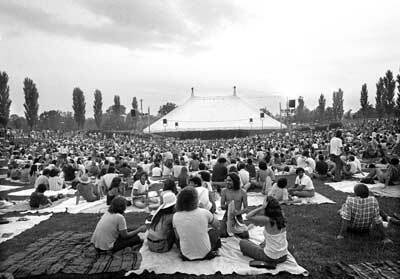 Approximately 100,000 people attended. Biff Rose MC’d. 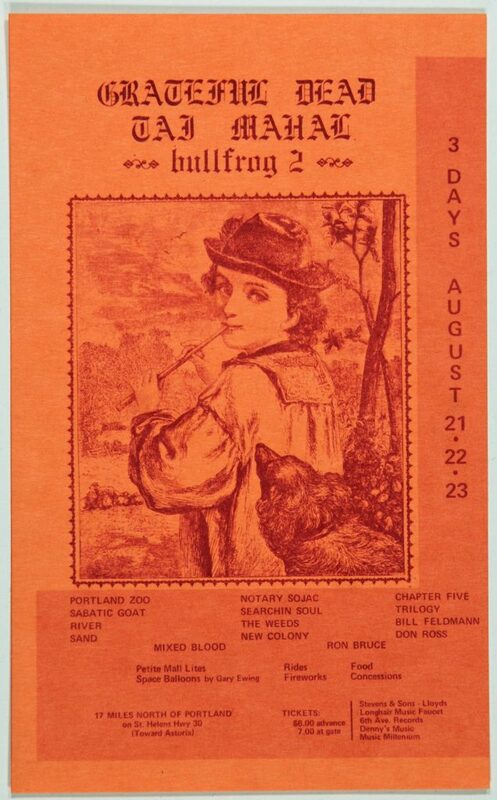 Rose filled in for Joni Mitchell when she started to cry and ran off stage in the middle of her 3rd song because the crowd was not paying attention to her performance. 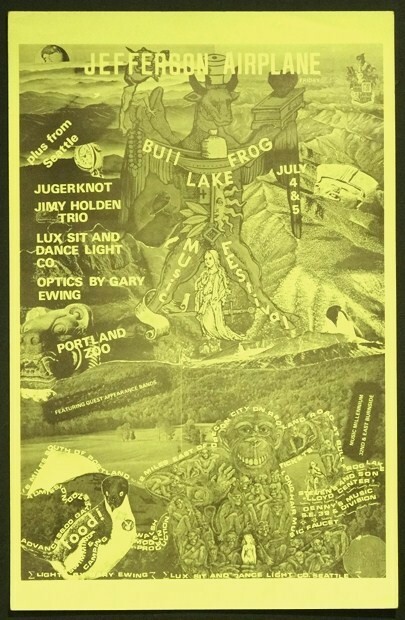 It seems she was placed in the rotation directly after Mother Earth featuring Tracy Nelson and the crowd wasn’t ready to hear her mild act. 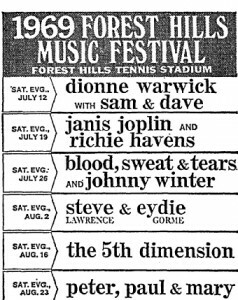 Crosby, Stills & Nash were originally on the lineup but ended up as a no-show, Nash supposedly had polyps on tonsils (but sang at Woodstock two weeks later). The Chambers Brothers were a last-minute substitute. 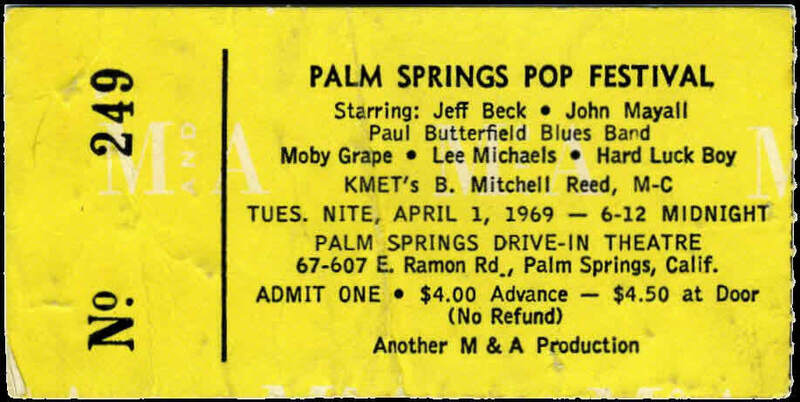 The Moody Blues were scheduled but weren’t there. 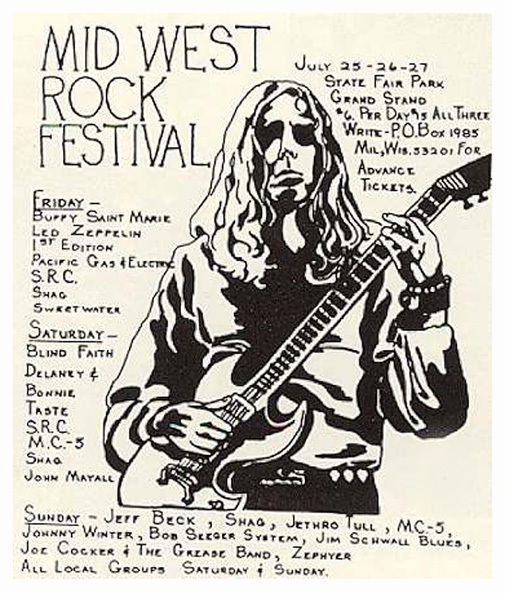 Johnny Winter was present but did not perform as his equipment did not show up in time. The festival attracted approximately 150,000. 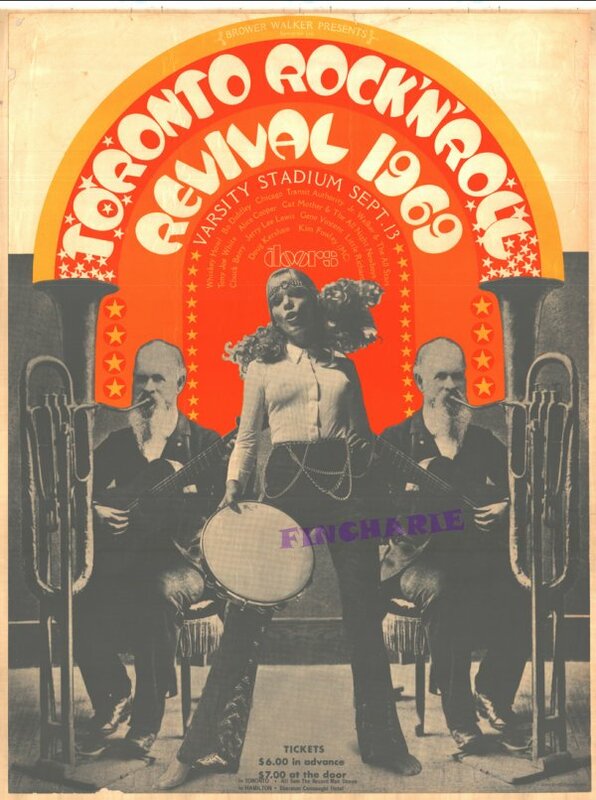 It became a legendary event largely owing to the participation of Bob Dylan who had spent the previous three years in semi-retirement following a motorcycle accident. 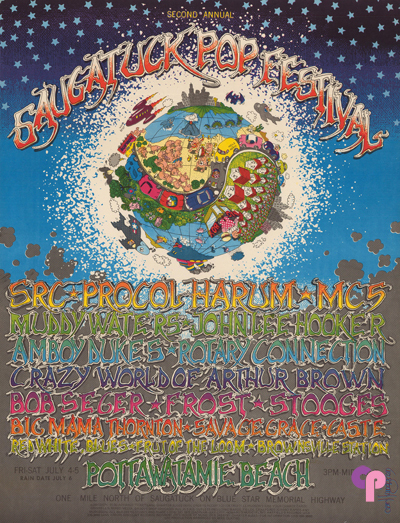 Attendance at the festival remains unknown, but is estimated between 120,000 and 150,000. Performers: White Fox, Snowrabbit, Deacon John and the Electric Soul Train, Whizbang, Axis, Sweetwater, Lee Michaels, Oliver, Cat Mother and the All Night Newsboys, Spiral Staircase, It’s A Beautiful Day, Country Joe and the Fish, Byrds, Youngbloods, Canned Heat, Pot Liquor, Chicago (Transit Authority), Tyrannosaurus Rex, Santana, Iron Butterfly, Jefferson Airplane, Grateful Dead, and Janis Joplin. Over 20,000 attended. The appearance of John Lennon, Yoko Ono and The Plastic Ono Band was not publicly known in advance. 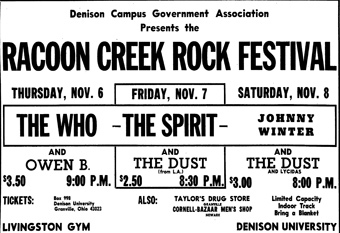 It was Lennon’s first-ever public rock performance without one or more of the Beatles since meeting Paul McCartney in 1957. He decided before returning to England to leave the Beatles permanently. 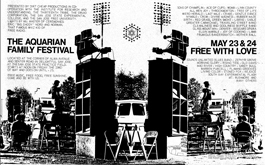 From a 2009 Palm Beach Post article: Then-Palm Beach County Sheriff Bill Heidtman vowed to make life miserable for the free-loving, pot-smoking, anti-establishment youngsters who were coming to the Palm Beach Pop Festival. He threatened to herd alligators toward the crowd, gathered on a grassy field at the Palm Beach International Raceway. And he promised to dig out fire ant colonies and relocate them at the venue. 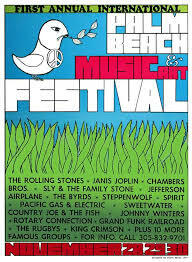 The Festival was at a drag strip outside of West Palm Beach. 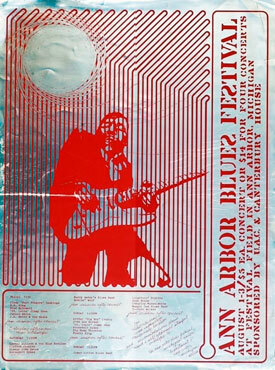 Among others, Grand Funk played three nights also. 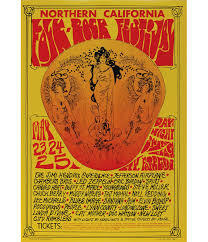 The show featured Iron Butterfly, King Crimson (Robin Fripp and Greg Lake), Jefferson Airplane, Rotary Connection (Minnie Ripperton), PG&E, Rolling Stones, Vanilla Fudge, Janis Joplin and Her Full Tilt Boogie Band, Johnny Winters, and others. 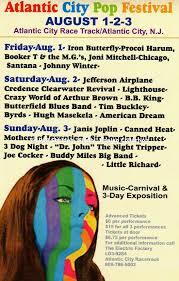 On the third night, Winters played, then Vanilla Fudge played followed by Janis Joplin. Afterwards, the announcer said, Johnny wants it, Janis wants it, and the Fudge wants one. All three bands came out on stage and jammed. 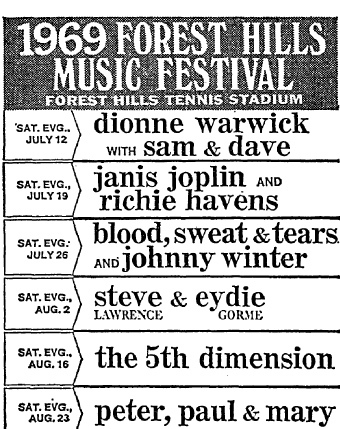 Winters jammed with the guitar players and scatted with Janis. 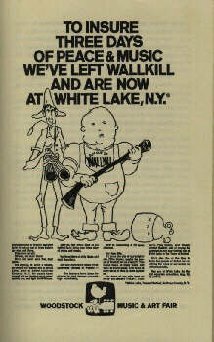 Wavy Gravy was there in his WW2 pilot helmet or whatever it was, guiding a car backwards trying to help them and backed them into the pond. We’d like to think he knew it was the police in an unmarked car and put them in the pond on purpose since we know he didn’t do drugs. 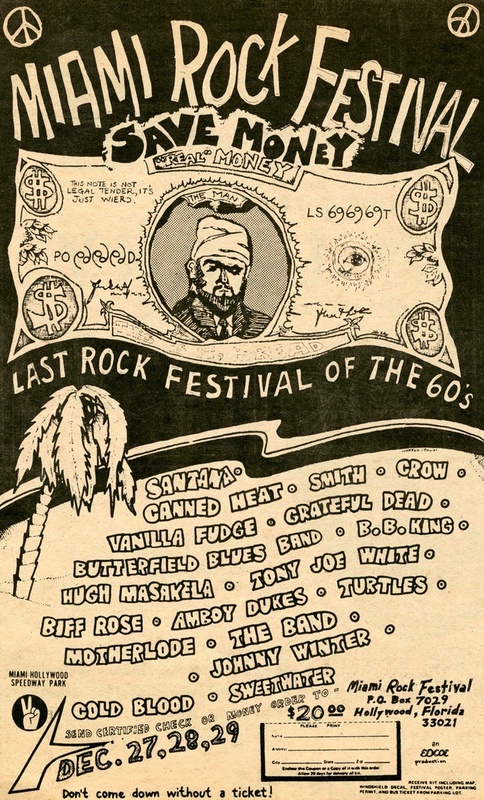 December 6, 1969: Altamont Free Concert: (at the Altamont Speedway in northern California, between Tracy and Livermore) headlined and organized by The Rolling Stones, it also featured, in order of appearance: Santana, The Flying Burrito Brothers, The Jefferson Airplane, and Crosby, Stills, Nash & Young, with the Rolling Stones taking the stage as the final act. 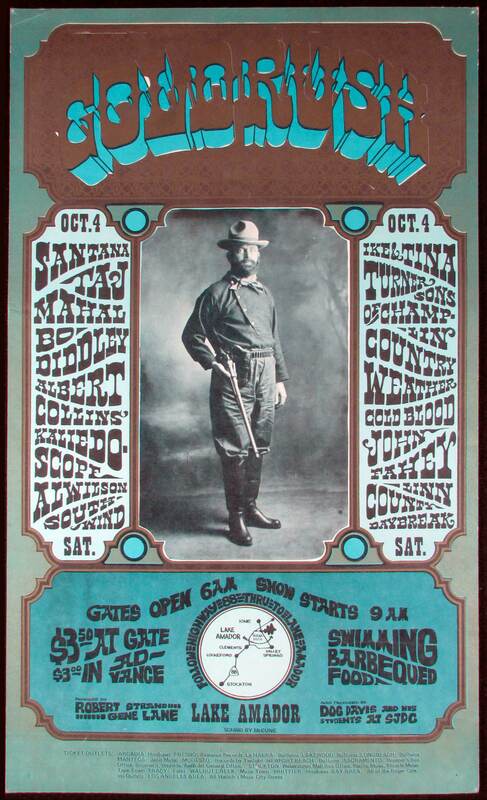 The Grateful Dead were also scheduled to perform, but declined to play shortly before their scheduled appearance due to the increasing violence at the venue. 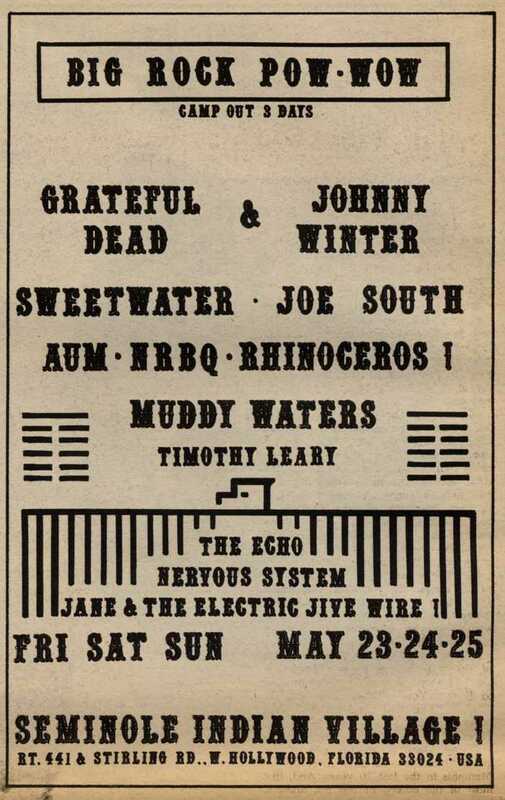 Among the bands playing were: BB King, The Band, Santana, Paul Butterfield Blues Band, Johnny Winter, Grateful Dead, Canned Heat, Sweetwater, Vanilla Fudge, Hugh Masakela, Amboy Dukes, The Turtles, Biff Rose, Tony Joe White, and Celebration. 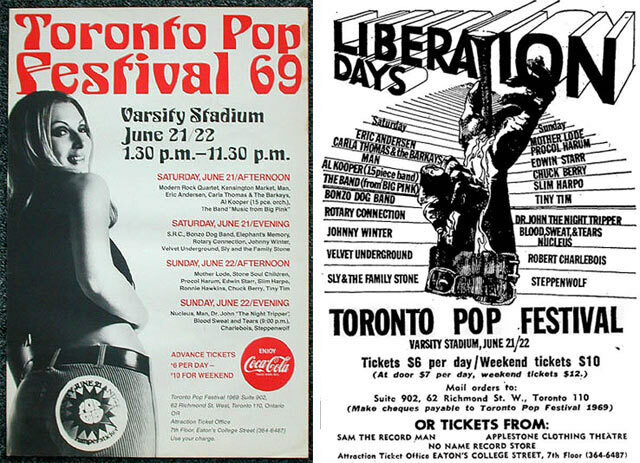 ...and finally, the “last” festival of the 1960s. Well not really because it didn’t happen. 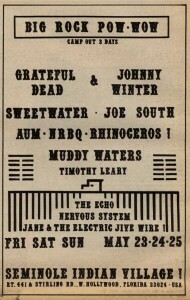 But Johnny Winters would have played (AGAIN) that year! 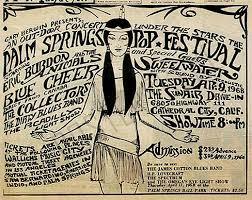 Janis Joplin, Jefferson Airplane, Young Rascals, Vanilla Fudge, Brooklyn Bridge, Neil Diamond, and many others were to attend. Thanks for the memories. I was 16 years old in 1969. It was one of the best years.